Last June, my eyes popped wide and I snapped this picture outside my Regents' grading site. 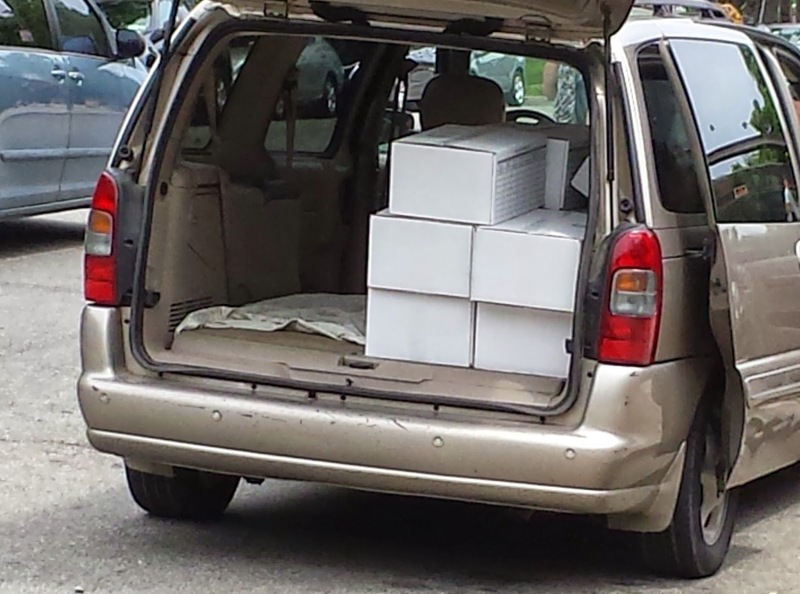 Students' regents exams were sitting exposed to all in an open vehicle. It struck me as odd and unsafe at the time. I didn't think and I still don't think that anyone would steal exams. It would have to be one desperate criminal. First, there's no money to be made in it; two, the boxes are very heavy and, three, it surely, in some ways, constitutes a crime against humanity. I suppose some unschooled crook might have supposed the box to be filled by unmarked bills, but I think it is far more likely that the boxes were lost through carelessness, rather than crime. My vague sense of foreboding about the situation, unfortunately, turned out to be correct. The New York Post recently published a piece entitled, "127 students must retake Regents after city loses their exams." One could not help but feel for the kids at Thomas Edison Career and Technical Education HS, Community Leadership, Hillside Arts and Letters Academy and Jamaica Gateway, all in Jamaica, Queens. I suppose some people view these students as statistics, but each has his or her own story of hardship. And, I feel like anyone of them could be my student or my child someday. Tests have been lost before, but only recently has the situation worsened. In 2012, seventeen exams from FDR HS in Brooklyn were lost. Last year, seventy-five tests from Chelsea Career and Technical Education HS supposedly fell off a truck and vaporized. I have no idea of the statistics before that date, but I would bet the number of lost tests was very low. It's sad that as "reformers" try to punish teachers, they also punish students. "Reformers" tie NY teachers evaluations to student test scores. Then, they craft impossible tests with devilish cutscores. They observe academic chicanery--which I suspect comes top-down in schools that experience desperate situations, fear of closure under Mayor Bloomberg, and administrators with sub-standard morals. So, now, no teacher can be trusted to grade any exams from his or her own school. Teachers must shuttle themselves around the City as their students' tests are shuttled in an opposite direction. Teachers often wait in the beginning at their grading sites for tests to catch up with them. Precious time is lost. For the twenty years or so that tests were graded in my school, to the best of my recollection, only one exam was lost. We ran down the hall to the proctors' room. We searched the garbage cans. We searched the bathrooms. We interviewed the proctor. We called the student, realizing if she had taken the test with her, it must be invalidated, but we could call off our search. We turned everything upside down again and again. In those days, teachers often stayed late to help their school community in a time of need. (Now, we grade on foreign turf and there is a clear division of labor between those who do the official sorting and those who are trusted only to grade exams from schools other than their own). The poor girl had to retake the Regents. Happily, she passed. The test had not vaporized, however. Months later, it resurfaced. While checking a class set of scantrons, a teacher jammed the machine. The screwdriver was brought in and the lid removed. Lo and behold, there was the missing Regents scantron crumpled up and buried in the recesses of the machine. The necessary paperwork was completed. The mystery was solved. The case was closed. So, how can we prevent more tests from being lost in the future? In my mind, the solution would be to give students reasonable tests and detach student scores from teacher evaluations. But, alas, that solution would show too much respect for teachers and make too much sense in an era when the teacher has a necessary role to play in educational "reform," that of the scapegoat.